This article contains plot details from Metal Gear Solid V: Ground Zeroes and Metal Gear Solid V: The Phantom Pain. Something weird happened at the offices of video game publisher Konami over the last year or so. Slowly and quietly, pretty much every one of its big-budget games were put on hold or canceled entirely as the company changed its focus from those expensive gambles to pachinko machines and cheap, safe mobile games. The big exception to this was Metal Gear Solid V: The Phantom Pain, but even it wasn’t immune. Amid a flurry of rumors and speculation, word leaked out months before the game’s release that its creator, Hideo Kojima, had left Konami. 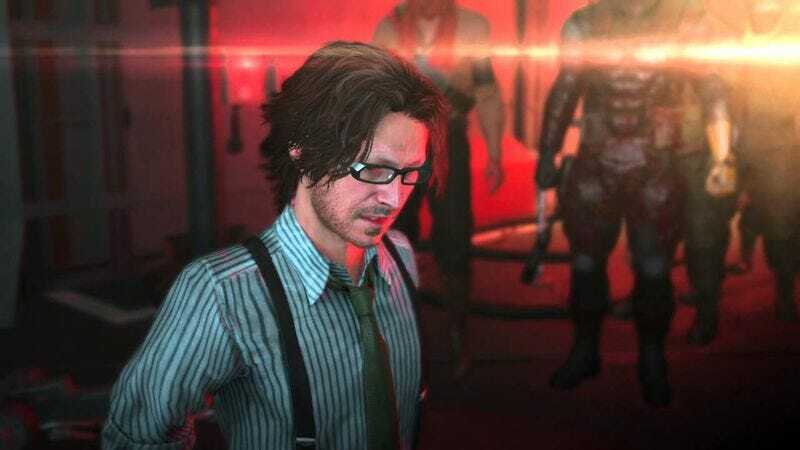 Neither party has really said anything about the split, but there may be some secret commentary about all of this hidden in Metal Gear Solid V. You just have to use the right pair of glasses to see it. The spectacles in question first pop up in Metal Gear Solid V: Ground Zeroes, and while they’re not relevant to the plot, the plot is relevant to where they end up. Ground Zeroes serves as a prologue to The Phantom Pain where, as legendary mercenary Big Boss (or “Snake”), your mission is to rescue a pair of important prisoners from an American black site. While you’re doing that, a team of inspectors from the U.N. is visiting your headquarters (a repurposed oil platform called Mother Base) to make sure your private military force is on the up-and-up. The inspectors were invited by a guy named Huey Emmerich, a scientist and loyal member of your team. When you finish your mission, though, you discover that the inspectors are actually enemy soldiers, and they’re in the middle of killing your men and destroying your base. Snake’s helicopter gets shot down, and he falls into a coma. On top of the main story mission, Ground Zeroes also includes an array of secondary activities, called Side Ops, that aren’t necessarily canonical but do feature a few fun meta jokes for Metal Gear fans. One such Side Op revolves around a silly cameo from Hideo Kojima himself, and when you meet up with him, Snake hands him a pair of very unusual glasses. The game’s camera lingers on them as the digital Kojima breaks the fourth wall and makes a joke, but the reason it focuses on these glasses is because they’re based on the actual pair that Kojima wears in real life. Speaking of, let’s talk about Kojima in real life. He got a job at Konami in the ’80s, and was soon put in charge of an action game for the Japanese MSX2 computer called Metal Gear. It was later brought over to the NES, and Metal Gear went on to become a huge hit for Konami alongside other long-running titles like Contra, Castlevania, and (much later) Silent Hill. As those other games gradually became less well-received over the years, Metal Gear hung on and continued pulling in both critical acclaim and strong sales. Kojima became one of the most famous game designers in the world, was put in charge of his own team (Kojima Productions), and was even named the Vice President of Konami Digital Entertainment. Then, in March of this year, rumors started going around that Kojima had left Konami. As covered in this Kotaku post, people noticed that his name was removed from the company’s website and Kojima’s name and his studio’s iconic logo were both removed from the official box art for The Phantom Pain. Shortly after that, a much-hyped Silent Hill reboot that Kojima was working on with Guillermo Del Toro was canceled, adding more fuel to the rumors that something shady was going on at Konami. Finally, in October, The New Yorker got in touch with some anonymous Konami employees who confirmed that Kojima had officially left the company after “a rather cheerful but also emotional goodbye.” The article also suggests that Konami is undergoing massive internal restructuring, not just so it can mostly focus on cheap mobile games that can make back their development costs in an instant, but so that it can focus entirely on cheap mobile games. The impression the story gives is that anyone or anything that doesn’t fit into that business model—even if it’s Hideo Kojima and Metal Gear, a series that just shipped 5 million copies of its latest game—no longer fits in at the Konami of today. None of this has been officially confirmed by the company, but the writing certainly seems to be on the wall. Kojima hasn’t said anything about this publicly either, but his glasses might give us a clue as to what he thinks about this separation. They make an appearance in The Phantom Pain as well, but this time, they’re worn by Huey Emmerich instead of the digital Kojima. The Phantom Pain takes place nine years after Ground Zeroes, with the survivors of that game’s ending—now a team of mercenaries called Diamond Dogs—believing Emmerich helped orchestrate the attack that destroyed the old Mother Base. Early in the game, you’re sent out to kidnap/rescue him from an enemy camp, and you decide to let him hang around your new Mother Base because you’re not sure whether he’s trustworthy. During an “interrogation,” his original glasses are destroyed and he switches to the exact pair that Kojima wore in Ground Zeroes and in real life. At first it just seems like a fun Easter egg for fans, but Emmerich makes this connection between himself and Kojima a bit more obvious later on. Throughout all of that, Emmerich is still wearing Kojima’s glasses. The game doesn’t draw attention to them the way it did in Ground Zeroes, but it’s clearly the same pair. It’s only the start of the parallels between the two, though: Both Emmerich and Kojima were effectively kicked out of an organization they helped build, both had to deal with the dissolution of the teams they were a part of, and both had to watch their organization head in a direction that didn’t fit their beliefs. Emmerich doesn’t support endless bloodshed, and Kojima simply doesn’t make quick and cheap games. We can even get literal with it: Hideo Kojima created the game Metal Gear while Emmerich created the giant robot called Metal Gear. So what does this mean for Kojima’s departure from Konami? Emmerich is clearly depicted as a villain in the game, and his actions are objectively wrong, but that doesn’t mean his argument is as well. Of the three guys he’s yelling at, two of them go on to become major villains in the series (MGSV is a prequel) and the other gets murdered. They can’t see it, but neither side of that argument is totally in the right or totally in the wrong; it’s just that their ideals have diverged to the point where they can no longer work together. If we extend that idea to Kojima and Konami, it seems like the scene can be read as Kojima accusing the company of sacrificing the passion that made it great in order to push a business model that’s all about ruthlessly making money. On the other side, Konami is telling Kojima that the kind of expensive games that he designs are no longer viable, and it has to move with industry trends in order to stay afloat. What happened to Kojima is certainly not as dramatic as what happened to Emmerich, but both of them ended up abandoned by their allies, left to drift alone with only enough supplies to survive (metaphorically, for one of them). Emmerich was the one guy at Mother Base who was a scientist instead of a soldier, and when the time came that Mother Base only had use for soldiers, he had to be let go. Likewise, Kojima was the executive at Konami who was a game designer instead of a businessman, and when the time came that Konami only needed businessmen who were willing to focus exclusively on projects that were guaranteed to make money, he also had to be let go. Kojima and Emmerich aren’t heroes, and Konami and the Diamond Dogs aren’t evil. They all just did what they thought was right.